As a startup, we’re clearly fans of Fred Wilson’s blog, AVC. (For those less familiar, he invested in some pretty successful stuff, like Twitter.) He recently pondered the sources of his blog traffic, comparing and contrasting social versus search and offering this screenshot of his own analytics. More than 200,000 visits a month? Not too shabby, Fred. Wilson’s analysis of his own traffic concluded that his regular traffic is mostly regular visitors (Feedburner and direct) and then about 40% social (startup people love to Tweet) and 10% search. He wondered if there was a broader study about web traffic trends. Our findings based on aggregate data for 2012 so far for more than 200,000 publishers who reach more than 260 unique monthly visitors each month. 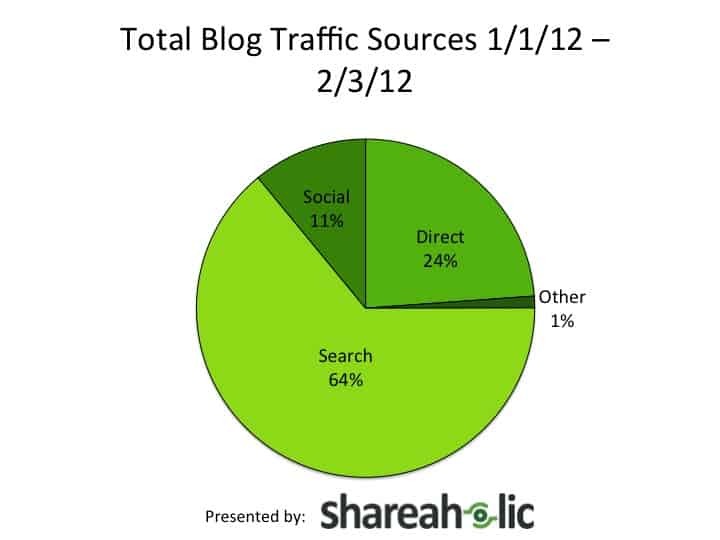 It shows that the majority of total blog traffic comes from search. Search accounts for 64% of overall traffic, while social media accounts for 11%. Direct traffic comes in third at 24%, and a combination of other traffic accounts for 1%. This accounts for the top 10 traffic sources. Although search is still king, we think it’s important to note that social is the number two source and it plays a strong role in search traffic and direct traffic. Google+ shares are taken into account in search results, and building a social media community is how you build a loyal following of regular readers who become that direct traffic. Fred Wilson has more than 200,000 followers on Twitter, but his blog content makes him an interesting guy to follow. These things go hand in hand, which is why creating high quality, interesting, shareable content is the name of the game. 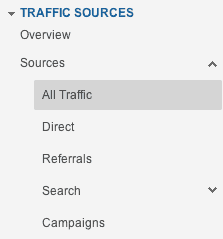 You can learn about your own traffic sources in Google Analytics by looking under Traffic Sources/All Traffic. Bonus tip: A really good report to check will be your Overview report. See what keywords are sending you traffic in the organic tab. Are they the ones you want to rank for? No? Improve your copy and focus on the terms you want to rank for and check back on your progress next month. What trends have you noticed in your blog traffic trends? Let us know in the comments! Want more blog traffic? Get more shares on your content and more readers with Shareaholic share buttons on your posts. Interested in the update to this and other Shareaholic Reports? See our most recent studies. Need more information? Feel free to contact us press@shareaholic.com.